There are many scholarships designed specifically for study abroad. We strongly encourage you to consider applying as Rochester students have won these scholarships in the past. Both merit and need-based scholarships are available, so even if you can easily afford to pay for your term abroad, you should still consider applying. Studying abroad has associated out-of-pocket costs that you must prepare (and save!) for, even if you do receive a scholarship. See our program costs and fees page for a list of expenses associated with education abroad. Application requirements: Scholarship application and eligibility requirements vary and researching and applying for scholarships will require time and effort on your part. Some applications require no more than a simple application form and a copy of your financial aid paperwork, while others may require these, a transcript, essays, and letters of recommendation. Scholarships represent an honor that will enhance your résumé and can be well worth the effort. Recipient requirements: In order to promote education abroad opportunities, some University of Rochester and external scholarships require follow-up projects or other ‘give back’ by recipients. Students who do not complete the requirement by the stated deadline will have their scholarship rescinded. For additional information, view the Spring 2019 Scholarships for Rochester Students Information Meeting presentation. Most national or federally sponsored scholarships (such as Gilman and Boren) are open only to U.S. citizens, and in some cases, to Permanent Residents. Therefore, your scholarship options are limited in comparison to U.S. citizens. That said, many study abroad programs offer scholarships to participants, regardless of citizenship (CIEE and IES Abroad, for example). Students who participate in our exchange programs are automatically eligible for a $2000 scholarship. Engineering majors may apply for a Hajim International Experience scholarship for summer, semester or academic year research, study, or internships. Spend some time perusing the resources below for options. Description: Enables students who have limited financial means to participate in study abroad opportunities worldwide. Eligibility: Students must be U.S. Citizens receiving a Federal Pell Grant at the time of application and cannot be studying abroad in a country currently under a US Department of State Travel advisory of Level 3 or 4, or in Cuba. Summer programs must be at least three weeks long. 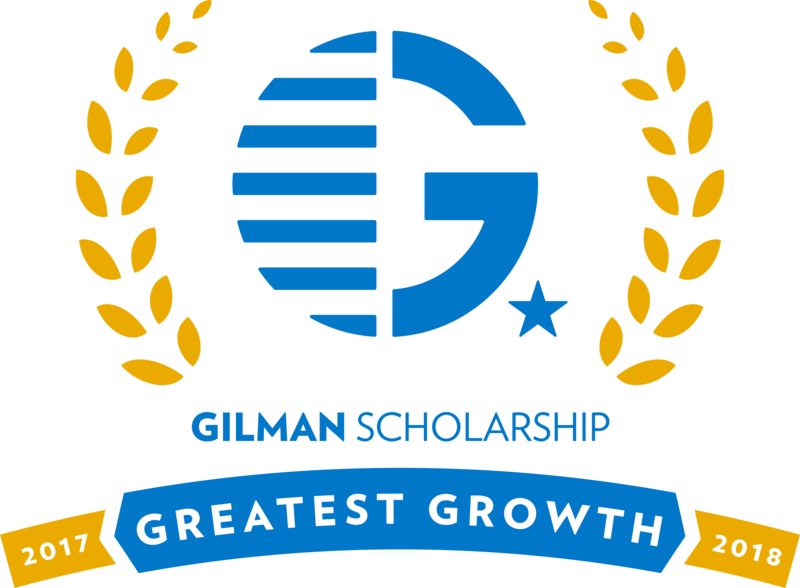 Read Tips for Applying for a Benjamin A. Gilman Scholarship. The University of Rochester has been recognized as a Gilman Greatest Growth Institution for the 2017-18 academic year! read more. Description: This program is a US government program to promote study, and the study of critical languages, in certain non-western countries. Boren Scholarship recipients commit to working for at least one year in the federal government. Eligibility: Must be a US citizen applying to a study abroad program in a country outside of Western Europe, Canada, Australia, and New Zealand. Summer scholarships are for STEM students only. Description: This scholarship for $5,000 is awarded to 15 students toward their undergraduate education. The award may also be applied to an education abroad experience. Eligibility: Must be a full time University of Rochester Student of Italian descent that is a legal resident of the greater Rochester area, Nassau County, or Suffolk County. The student must also have at least a 3.0 GPA. Website: For Nassau and Suffolk County residents, view here. For great Rochester residents, view here. Description: Various scholarships for the study and research of Biology, Ecology, Environmental Science. Description: This scholarship is awarded to the student who has the best understanding of the importance of language learning and its place in society. The winner will receive a $1,000 scholarship that will be awarded directly to the student and can be used for tuition, books, language classes, etc. Eligibility: Undergraduate students who are U.S. Citizens, have a minimum 3.0 GPA, are currently studying a foreign language, and are not on probation or suspension. Description: This Scholarship provides $1000 each to help pay expenses associated with participation in an archaeological field work project (minimum of 4 weeks). Eligibility: Students who have begun their junior year of undergraduate studies at the time of application, and who not have previously participated in archaeological field work of any kind. Description: The TecEx Scholarship Opportunity awards a $1,500 USD Scholarship to one recipient every academic year. The sponsor (“TecEx”) offers the Scholarship to post-secondary students who demonstrate outstanding academic achievement. This is an opportunity for students to be a voice in the growing conversation about the impact of technology on international business. Description: The Association of Teachers of Japanese Bridging Project offers scholarships to American students participating in study-abroad programs in Japan. Eligibility: Undergraduate students majoring in any field of study are eligible to apply for these scholarships. Japanese language study is not a prerequisite. Applicants must be US citizens and be enrolled in a college or university in the United States. *Students must have at least one or two years of academic experience in these languages to be eligible. Eligibility: Must be a U.S. citizen and student can apply to one language only. Eligibility: U.S. citizen or Permanent Resident, currently receiving need-based financial aid or can demonstrate a verifiable need for financial assistance. Description: This is a merit-based scholarship for funding study, senior thesis research, and/or internships in Germany. Eligibility: Sophomores and juniors looking to go abroad in Germany next year who demonstrate an interest in contemporary German and European affairs. Description: This is a scholarship offered to two U.S. students to study abroad in Ireland. For the two grand prize scholarships (tuition waiver + stipend), you must be a U.S. citizen to win. For the additional scholarships offered by universities and partner providers totaling over $50,000, you must be a citizen of the U.S., Canada, Ireland, South Africa, Australia, New Zealand, or the United Kingdom to be eligible to win. If you are not a resident of the countries listed above, you are not eligible to win in this year's scholarships, but you are still welcome to apply, and will receive additional information via email to help your Ireland study abroad dreams come true. Description:The Overseas Student Program at BGU has several tuition scholarships available for students who will be studying with us for the Fall 2018 semester. These scholarships are in the amount of $7,200. Deadline: E-mail osp@bgustudyabroad.org for deadline and more information. Description: CIEE offers both merit-based and need-based scholarships for students who are applying to participate in a study abroad program sponsored by CIEE. DIS Scholarship: Awarded on the basis of demonstrated financial need. Diversity Scholarship: Awarded to support students from populations that are underrepresented in study abroad such as those from diverse ethnic, racial, cultural, sexual orientation, and educational backgrounds, including first-generation college students. Pioneer Scholarship: Awarded $500 to $3,000 based on financial need, this award is available only to DIS Stockholm students enrolling in the fall 2017 semester; may be combined with above scholarships for an individual maximum of up to $8,000. Jacob Buksti Memorial Scholarship: This merit-based award for political science, international relations, economics, or related majors looking to pursue a career in politics. Description: Apply today to receive one full scholarship or one of four $20,000 awards offered each semester towards your application to study at the China Institute through the University of Dayton. Students who are not recipients of a Diversity Abroad & China Institute Scholarship award will still be considered for up to $15,000 in scholarships upon successful completion of a program application. Description: Hebrew University offers a variety of need-based and merit-based scholarships for students who plan to study abroad at its Rothberg International School. Merit Scholarships: This scholarship award is in the amount of $6,000 for one year of study, and $3,000 for one semester of study. Spring in Jerusalem Honors Program Scholarship: A limited number of merit awards are offered to highly qualified, motivated candidates participating in the Spring in Jerusalem Honors Program from universities throughout the United States. Art Merit Scholarship: This scholarship award is in the amount of $6,000 for one year of study, and $3,000 for one semester of study. RIS Levine Scholarship: The Louis Levine Scholarship is awarded to an outstanding student with a keen desire to further scientific knowledge in our ever-changing world. Description: IES offers over 15 different need based, donor-funded, and diversity scholarships and grants for students who are applying to IES programs. Description: MEXT Scholarship for Japanese Studies Students at Waseda University. Eligibility: Applicants must be enrolled in a university at the undergraduate level (graduate students are not eligible to apply) and be majoring in fields related to Japanese language or Japanese studies/culture at the time of both arrival in and departure from Japan. For further information, please contact Mr. Rohan Palma in the Center for Education Abroad. Applicants must have studied the Japanese language or Japanese studies/culture at a university for a total period of at least one year as of April 1, 2019. Description: Philanthropist Shelby M.C. Davis will generously provide support to increase the number and diversity of international and American students on Semester at Sea (SAS) voyages during the 2019-2020 academic year. Building on the strategy for advancing international understanding through education developed by the Davis United World College Scholars (DUWCS) Program, Mr. Davis is offering up to 20 full, need-based scholarships for enrolled Davis UWC Scholars to study abroad on a Semester at Sea academic voyage (SAS). Eligibility: This scholarship is for engineering majors who study on our exchange program at the University of Sheffield. Golden Key International Honor Society andNational Society of Collegiate Scholarsoffer study abroad scholarships for members. Description: The University offers a variety of scholarships for students who participate in programs organized or led by Rochester faculty. University of Rochester undergraduates in The College, the Hajim School, and the Eastman School of Music (summer programs only) who participate in River Campus faculty programs abroad for credit are eligible to apply. Preference will be given to students with little or no previous participation in a program abroad. Selection is based primarilyon financial need. Merit, and the student's ability to articulate their interest in going abroad are also taken into consideration. Recipients will be expected to share their experiences with the University community and/or with the scholarship donor, depending upon the scholarship awarded. Deadlines: February 1 (Dept. of Modern Languages and Cultures summer programs); March 15 (All other summer & fall programs); September 7 (Fall Break 2018 programs); October 1 (Winter Break programs) October 15 (Spring, Spring Break programs). Applicants will be notified of a decision, through the Education Abroad Portal, within two weeks of these dates. The award(s) for the academic year programs fund a portion of your Rochester National Grant and do not result in an increase in your overall financial assistance. Financial Aid will be credited toward the program fee and reflected on the term bill. The award(s) for summer programswill be applied to your summer financial aid package and will be credited toward the program charges and reflected on the term bill. The only other sources of financial assistance available during the summer session, for those students enrolled at least half-time (6 credits), are student/parent loans. Students who are awarded a scholarship for a short-termEducation Abroad program will need to have their financial aid packages updated to reflect this financial assistance. The scholarship will be added to the financial aid for spring semester (to fall semester for fall break programs) and will disburse to the student account and applied directly toward the cost of the program. Service requirement: recipients of these scholarship are required to help promote University of Rochester education abroad opportunities. Examples include but are not limited to: blogging while abroad, attending information sessions, classroom visits, creating promotional materials, written report to the donor. Description: Offers grants for undergraduate Hajim students to pursue academic studies or credit-bearing, career-oriented and research internships abroad. Eligibility: Enrolled in a Hajim major; in good academic standing; have applied or intend to apply to a qualifying program; complete an application and statement of purpose essay. Program applicants will automatically be considered. Awards up to $2500. RIG, REACH (Summer Internship) funding, and Discover Grants may be applicable to education abroad. Discuss with the fund/program advisors. Note: The money received through crowdfunding is considered taxable income. Before making a request, you need to consider how receiving such funds will affect you.